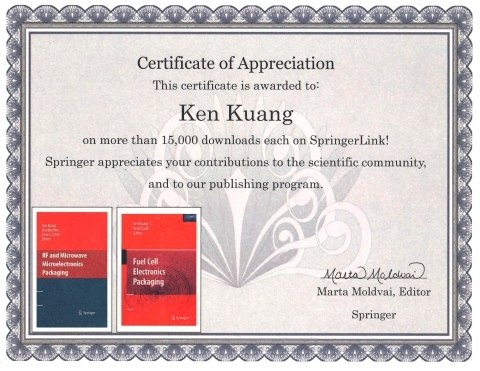 Torrey Hills Technologies (THT) President and CEO Ken Kuang was recently honored with a certificate of appreciation from book publisher Springer for reaching over 15,000 digital downloads of books that he has authored. Three of the four books that Ken has written have been published by Springer in particular: Advanced Thermal Management Materials (2012); RF and Microwave Microelectronics Packaging (2009); and Fuel Cell Electronics Packaging (2007). Ken has also achieved Bestseller status on Amazon, when From Start-Up To Star: 20 Secrets To Start-Up Success reached the #2 best-selling book on Amazon in only 3 months. While his first three books are highly technical, From Start-Up To Star explores Ken's humble childhood in China and his inspiring journey starting his own company in America. Filled with tips and insights about building a successful business based on his experiences, From Start-Up To Star is an engaging and informative read.